An in-vessel composting system is a confined process in which composting is accomplished inside an enclosed container or basin. It produces a more stabilized and consistent product in less process time because of its ability to control environmental conditions, such as airflow, temperature, and oxygen concentration. It also affords better containment and control of odors. Detention time in a reactor varies from 10 to 21 days depending on the system supplier's recommendations, regulatory requirements, and desired product characteristics. 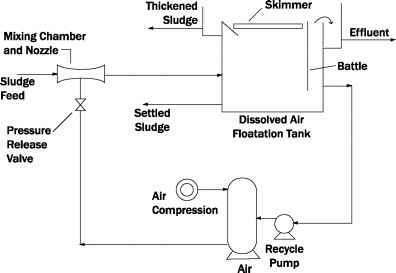 A schematic of a typical in-vessel process is shown in Figure 7.8. Figure 7.7 Configuration of extended aerated pile. Figure 7.8 Schematic of in-vessel composting process. Reactors are loaded with the composting mixture for only a portion of a day (in smaller plants sometimes only five days per week). However, the sludge dewatering operation is normally for a longer period of time than the loading period of the reactors. Therefore, a storage facility is required for storing the dewatered sludge in addition to the storage facilities required for storing bulking material, amendment, and compost. The storage facilities can be covered piles, live-bottom bins, or silos. In-vessel composting system is divided into two general classes: plug flow reactors and agitated (also known as dynamic) reactors. The plug flow reactors are divided further into vertical and horizontal plug flow reactors. Figures 7.9 and 7.10 show the various types of reactors. Vertical plug flow reactors are constructed of steel with a corrosion-resistant coating, reinforced fiberglass, or concrete. Dewatered sludge cake is mixed with recycled compost and amendment or bulking agent and is added to the top of the preceding day's fill. The material in the vessel is aerated but not agitated or mixed. When the bottom compost layer is removed by a live bottom auger discharge or by a sliding frame and conveyor, the entire content of the vessel moves as a plug to the bottom. 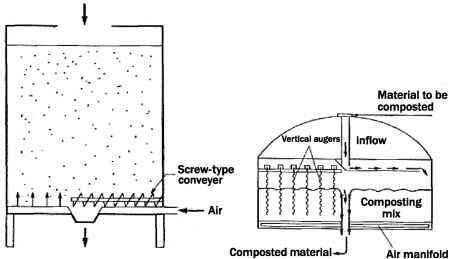 fiberglass boxes), configuration of the aeration systems, and discharge devices. Horizontal plug flow reactors (also known as tunnel reactors because of their shape) are typically constructed of concrete. Air is supplied by a blower through floor-mounted diffusers. A typical reactor unit is approximately 5 m (18 ft) wide, 3 m (10 ft) deep, and 20 m (65 ft) long. Fresh mix is loaded at the inlet end and a pneumatically or hydraulically operated ram pushes the materials longitudinally toward the other end. Finished compost then falls onto a discharge conveyor. In an agitated in-vessel reactor, the composting material is mechanically mixed periodically during the composting process. Physically, the reactors are open-topped rectangular bins and are enclosed in a building. A circular type is also available in the United States and is typically covered with an aluminum geodesic dome. In both types, air is supplied from the bottom. 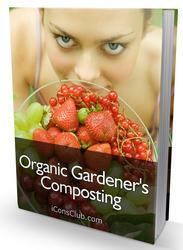 The depth of the compost bed is 2 to 3 m (6 to 10 ft) and air is supplied from the bottom. 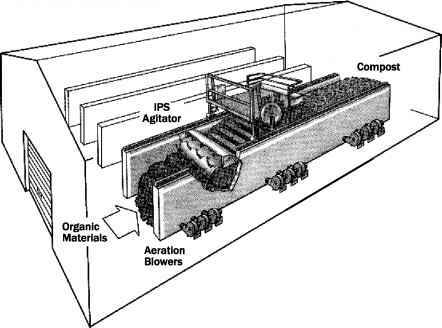 Of the two major rectangular types of reactors available in the United States, in one type the compost is both agitated and removed from the reactor by a mobile extraction-conveyor device that spans the reactor. In the second type, the agitator is located on top of the reactor and it digs out the material and redeposits it behind the machine. In the circular reactor type, fresh material is loaded on the perimeter, and vertical augers agitate and move the mix to the center of the reactor.